Hi guys, in this post I will explain how can you use Team Assessment Survey as a tool for a retrospective. On my current job I was exposed to the SAFe framework by Dean Leffingwell, this framework provide a team assessment survey, the exercise that I will teach here is an adaptation of Dean’s assessment. The original assessment can be found here. This exercise can be found in the book: “Getting Value out of Agile Retrospectives”, a book written by me and Ben Linders with the foreword from Esther Derby. The book can be downloaded by free in LeanPub.com or InfoQ.com, please download it and spread it within your colleagues. Each of the areas has different questions that can be rated from zero to five, allowing the team to visualize what are the areas that need more attention from the team. 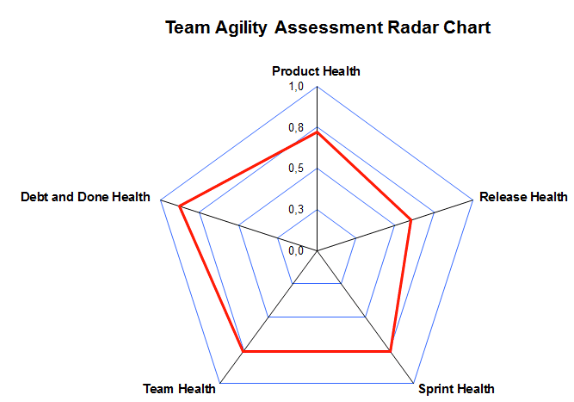 This is a great exercise to reveal the overall agile health of a team. I believe this technique is quite simple and does not require any special occasion. Although, it might be suitable for situations when a team wants to understand better how well they are implementing Agile. This exercise will not solve specific problems that occured during the sprint, but might reveal some of the causes why those problems happened. For example if the team is finding a lot of bugs during development it might be that their Unit Testing, or automation practices is not being well implemented. To Perform this exercise you just need an excel sheet. Like I said before that excel well have four main areas (Product Ownership Health, Sprint Health, Team Health and Technical Health). For each different areas you create several questions that you think are appropriate for your team. You can always refer the questions from SAFe Team Scrum XP assessment that you can find here. Below I list two questions as an example for each different areas. All these questions can be rated from zero to five, zero means “Never”, five means “Always”. During the retrospective the team just need to fill the excel file as a team and evaluate themselves to see where they stand. If you want, you can create a nice graphic to easily see the result of the assessment. An example can be seen on the picture on the right side. Visualizing the graphic will give a team a good understanding where they stand, with the graphic in front of them they should decide which area they want to improve, again chose only one area at the time and one topic within the area. Like many other exercises that I explained this exercise does not require to have a collocated team (true, but they would need some kind of scoring and voting mechanism). This exercise can be run in a virtual setup where the team is spread all over the world. What do you think about this exercise? Do you think it could be useful for you? Please leave me your ideas. Good one Luis, I deployed it in one team few weeks ago. I will deploy it in more teams during the next weeks. Very useful and very simple to do. I personally combine this one with PO and stakeholders score cards ( http://wp.me/p3ln09-4o ). Score cards allow me to capture the perception and feedback of PO and stakeholders about how the team is working. I am preparing one new post with the result of those score card (I have around 8 months of info now with one team), you will see it soon in my linkedin/twiter. Good one .. different from the other Retrospective techniques we have been reading / using. I use something similar, but not as a retrospective exercise. I typically will use that in the beginning of a coaching engagement so I can understand where the team is and where they want to be (they may not want to be a Ri team (or 5) across the board). So, it is good to make sure you understand what their goals are, and how they are going to reach them. I would recommend you reassess at least quarterly. I was thinking on the same and got the detailed information in this website. I will try this today.